Sig Sauer has been expanding the last few years. They dove into selling multiple new product lines. Optics, silencers, ammunition, and airguns have been added to their product line. You’re in the market for a scope, and you may be asking, what is the best Sig Sauer scope? I’ve researched for you, and came up with my top picks for you to check out. My favorite Sig Sauer scope is the Sig Sauer Whiskey 3. The Whiskey 3 features low dispersion glass, a rugged chassis, capped wind age and elevation turrets. The industrial design provides reliability and protection from rough elements. It includes one free sbt custom lasered elevation dial calibrated to your ballistics and environmental conditions. If you are new to gun scopes or are looking at gathering more information before you buy a scope, our crash course in scopes will give you the answers. The decision to own a gun is a personal decision, and one to be taken seriously. Whatever the reason for owning a gun, hunting, personal defense, or recreational, you will want to be educated on the subject as much as possible. In your search for gun scopes you have probably come across some new terms that you may or may not know the meaning of. There is specific terminology with optics and I’ll list some here. Eye Relief: How far your eye is from the eyepiece. Objective Lens: The diameter of the objective lens, usually measured in millimeters. The larger the number means a larger lens. The larger the lens the more light can enter it yielding a brighter picture. Field of View (FOV): The area you can see through your scope, measured from left to right. Tube Diameter: The majority of scopes have a one inch tube diameter. A larger tube does not let in more light. Length and Weight: Pretty self explanatory. Something to keep in mind is that the more weight you carry around can get heavier and heavier as the day goes on. A lightweight scope is a good choice. Parallax: This is how the reticle appears on the targeted object at different ranges. Turrets: These are the knobs on the top or side of the scope. These adjust for both wind and elevation. Zero: When your gun and scope are sighted in together. Power: The level of magnification. Fixed Power Scope: The magnification is fixed to a certain power. Variable Power Scope: Used for shooting at different distances, a variable power scope can have magnification of different powers. These are a few of the terms and parts of a scope you will need to understand. Sighting your gun scope is for rifles and long distances. Follow the manufacturer’s directions for mounting the scope then you will need to follow these steps to zero your scope. Bore Sight (Optional): You can get a bore sight to get your gun scope roughed in, but this is optional. It is recommended that you do this at a range, rather than your back yard. At The Range: If you skipped the bore sight, this is where you start. Put the target out to 25 yards. Get comfortable and take a shot when you’re ready, aiming for the bullseye. It’s best to shoot a group of three or so shots to eliminate the possibility of a bad shot. Measure and Adjust: Take a look at your 25 yard target to see how close you were to the bullseye. Observe if there is any area that is off. For example, all your shots are off to the left ½ inch. Adjust your scope as necessary. Repeat: Repeat this process until your scope is zeroed in. You should be getting closer and closer to the bullseye. Adjust Distance: Now that you are comfortable at 25 yards you should move the target out to 100 yards and use this same process. As you can see, there is a lot to think about when it comes to scopes. Another thing to consider is that scopes for a handgun are different than scopes for a rifle. Not only do you need to consider the type of gun, but in what scenario will you be using the gun. 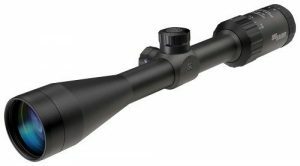 If you are looking for a scope for a handgun, it is going to be much different than a rifle scope. Most handguns will be used in close range shooting, with 25 yards being about the farthest distance. Keeping that in mind, you will not need a variable scope for a handgun. You can choose from red dot target acquisition scopes that are fixed scopes. Rifles are usually meant for medium to long range shooting. Keeping that in mind, you will want to choose from variable scopes, which will allow you to shoot at different distances. At this point you probably have a pretty good understanding of what to look for and what type of scope you will need. The next thing to consider is your budget. Some scopes can cost quite a bit of money. Thankfully, there are scopes that are good choices, that won’t break the bank. The more features a scope has the more expensive it will be. As you can see, not all features are necessary for each shooting circumstance. Let’s get on with our top picks. The Whiskey 3 is available in five different models, three different reticle types. Having some many options to choose from, there is bound to be one for you. The lenses on the Whiskey 3 are Spectra coated, giving you a highly efficient, anti glare lens. The Whiskey 5 is built to perform in the toughest conditions. It has a super zoom lens, HDX optical system, hellfire fiberoptic illuminated reticle, and a free sbt calibrated to your unique ballistics and environmental conditions. The Whiskey 5 is the top of the line hunting scopes (the Whiskey 3 are the basic). There are six Whiskey 5 models to choose from. This scope is Sig Sauer’s tactical line. 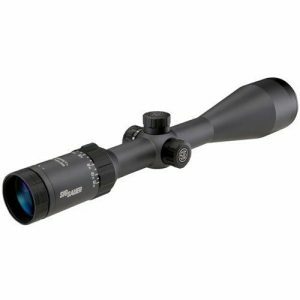 Sig’s apparent goal is to offer great scopes at great prices. They seem to be doing a fairly good job at this. 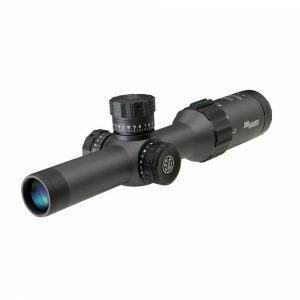 This scope has you covered from close quarter shooting to long range shooting, and everything in between. The Whiskey series is comprised of the Whiskey 3 and the Whiskey 5 riflescopes. These scopes have a goal of bringing every hunter’s or range shooter’s first shot count. They were engineered with high quality lenses to bring the most difficult target into sharp focus. There are several models to choose from. There is a price range within each scope. As we talked about, earlier in the article, different power of magnification and features will decide which price you will pay. The guarantee on a Sig Sauer scope can’t be beat. They promise to repair or fix your scope if it becomes damaged or defective, at no cost. Sig Sauer is a great company and wants to treat you right. I chose the Whiskey 3 as the top pick because it is more affordable than the 5. They are great scopes that won’t break the bank. You may not need all the features that the Whiskey 5 offers. This is up to you and your circumstances. You won’t regret purchasing the Whiskey 3 by Sig Sauer. You can find more scopes reviews here.